Hello and welcome to the 550th installment of the SWD. 15 September, our forces carried out two operations against the mercenaries of the Turkish occupation army in Rael village of Akhtarin in Azaz, killing 5 members of Sultan Mohamed Fatih mercenaries in addition to the injury of 8 others. Where our fighters targeted the headquarters of the mercenaries of Sultan Mohamed Fateh inside Rael village, the operation resulted in the killing of 3 mercenaries and the wounding of five others. On the same day, our fighters targeted al-Sultan Mohamad Fatih mercenaries affiliated to the Turkish occupation army at the entrance to Rael village, and according to the information we obtained, the operation resulted in the death of two mercenaries and the wounding of three others. We in the Wrath of Olive operations room emphasize that our fighters are everywhere, and carry out what is on them to beat the mercenaries who stained their hands with the blood of our people in Afrin, and we reaffirm that our operations will continue and escalate against the occupation. Syrian Arab Army’s air defenses shot down a number of missiles that were on their way from the Mediterranean Sea towards the city of Latakia. Reports also suggest that a number of missiles targeted Tartous, Homs, and Damascus, with air defenses also being active in those regions. The missiles were launched by a still unknown party, with most reports claiming that the Israeli Air Force is the perpetrator, however, it is still unconfirmed. 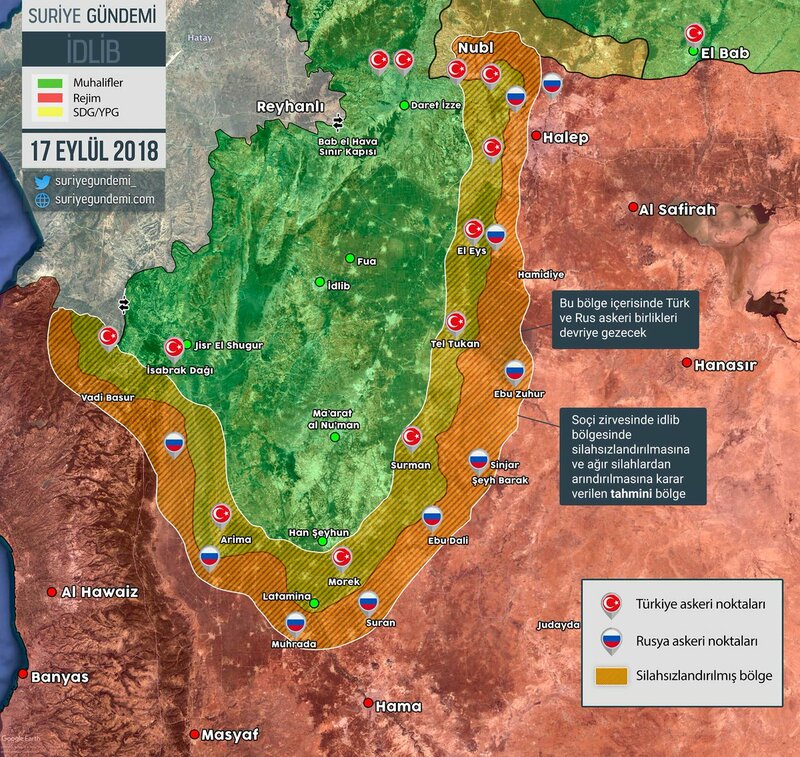 Russia and Turkey reached an agreement regarding the future of Idlib governorate, which includes withdrawal of heavy weapons from the buffer zone agreed upon by the two sides. The said buffer zone is expected to be 15 kilometers (9 miles) on both sides along the frontline. Suqour al-Sham’s commander, Mohammed Habib (Abu al-Mathana) and four of his elements raided the local council of Ariha and reportedly assaulted members of the local council. The elements reportedly seized the council’s official seal in order to prevent its future work. Army units liberated new areas in the area located between the administrative border of Homs and Deir Ezzor during the military operations against the remnants of Daesh(ISIS) terrorists in the Syrian al-Badiya (desert). 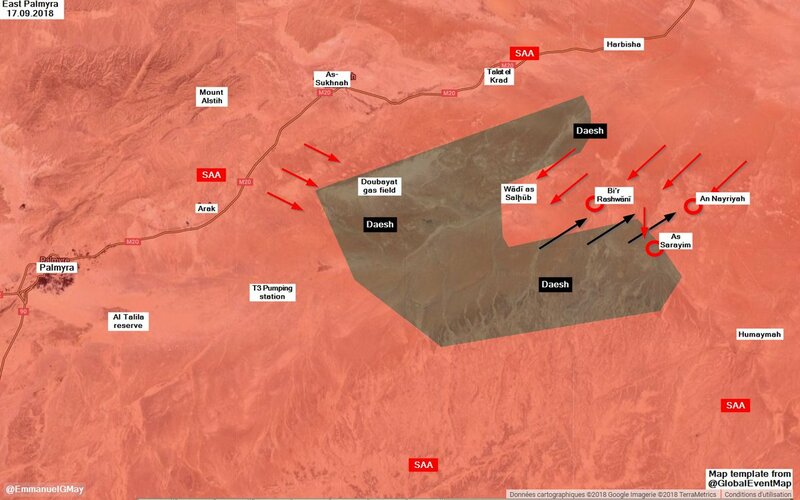 SANA’s reporter said that the army units, in cooperation with the allied forces, combed wide areas in the Syrian al-Badiya on several directions, in which the forces operating in Deir Ezzor began the sweeping operations, with the first axis starting from Hreibshah alongside the administrative border of Homs province until the surroundings of al-Tanf oil field in the south. The reporter added that the army units moved from al-Faidah village forces operating in al-Sikhneh Badiya pursued fleeing Daesh terrorists, liberating the areas of al-Rashwanieh, al-Taraym and al-Niyarbeh. The reporter indicated that the army units tightened the noose around Daesh’s remnants and destroyed their vehicles and weapons along the administrative border between Deir Ezzor and Homs. 1-Al-Bagouz axis: Our forces clashed with mercenaries of (Daesh) and terrorizing the terrorist, amid remarkable progress of our forces inside the town and the control of many points of mercenaries and their fortifications. In the midst of these clashes’ mercenaries relied on mines and booby traps to impede the advance of our forces, while their defense lines saw a collapse in front of the blows of our fighters, and the clashes moved to the center of the village. Clashes continued since yesterday evening and until this morning, where our forces were able to establish 12 fixed points inside Al-Bagouz and immunization against mercenaries, and the artillery of the International Alliance played an important role in targeting the fortifications and destruction of mercenaries. 2-The axis of Sousse: Since yesterday evening, our forces began to move again to advance the town, and clashed with the mercenaries’ face to face, where the most violent clashes in which the mercenaries used explosive belts, where two suicide bombers themselves, resulting in the upgrade of 2 of our fighters’ martyrs and wounding others. Later on, our forces completed their control of the course of the clash, advancing 2 km and liberating 11 points from the mercenary’s grip, while the intermittent artillery shelling continues on this axis. 3-Clashes between the two axes: since yesterday witnessed the death of 13 mercenaries and wounding a number we could not accurately determine, while dealing with engineering teams Sugar with 4 landmines and suicide bombers with two belts, while the International Alliance aircraft carried out 6 attacks on the movements of mercenaries, Fighters were killed and 3 wounded. 4-Humanitarian Situation: For the second day in a row, a number of displaced people who were able to secure their exit from the area of ​​engagement to the camp we set up in Al – Bahra village, where the teams began to receive them and provide shelter for them and provide the necessary urgent. Free Syrian Army’s Liwa Shuhada al-Qaryatayn reportedly reached an agreement with Russia regarding its evacuation from Al-Tanf area towards areas under the control of the Turkey-backed Free Syrian Army in northern Aleppo. The agreement was mediated by the former commander of the Free Syrian Army’s Maghawir al-Sahra, Mohammed Ahmed Shaaban (Al-Dabaa), who reconciled with the Syrian government in eastern Qalamoun in April of 2018. According to the agreement, elements of Liwa Shuhada al-Qaryatayn will be evacuated along with hundreds of civilians from Al-Rukban refugee camp. Unknown gunmen killed one and wounded one civilian on the road between Najran and Qarasa in western Al-Suwayda. Afghan National Security Forces killed three elements of the Islamic Emirate of Afghanistan (Taliban) and destroyed five vehicles in Chahar Bolak district. Afghan National Security Forces killed nine and wounded six elements of the Islamic Emirate of Afghanistan in Saydabad district. Islamic Emirate of Afghanistan overran an Afghan National Army’s base and two checkpoints in Laman area of Qala i Naw district. Afghan National Army’s commander Abdul Hakim and four elements were killed, while additional seven elements were wounded and two arrested. Three elements of the Islamic Emirate of Afghanistan were wounded in the encounters. Islamic Emirate of Afghanistan seized two pickups, a mortar, a PK machine gun, a sniper rifle, two RPG launchers, and two assault rifles from the overran installations. Afghan National Security Forces killed four elements of the Islamic Emirate of Afghanistan in Mata Khan district. Islamic Emirate of Afghanistan overran an Afghan National Army’s base in Kunsak area of Bala Buluk district. Nine elements of the Afghan National Army were killed and three arrested, while one element of the Islamic Emirate of Afghanistan was killed and three wounded in the encounter. Islamic Emirate of Afghanistan seized four PK machine gun, an RPG launcher, three assault rifles, and a sniper rifle from the base. Afghan National Security Forces killed three elements of the Islamic Emirate of Afghanistan, as well as destroyed several weapons depots and ammunition caches in Marjah districts. Islamic Emirate of Afghanistan attacked an Afghan National Army’s checkpoint in Tangano Godar area of Nawa-I-Barakzayi district. Four elements of the Afghan National Army were killed and wounded in the encounter. Islamic Emirate of Afghanistan’s improvised explosive device destroyed an Afghan National Army’s armored personnel carrier in Khushal Killi area of Nad Ali district. Afghan National Security Forces killed two and wounded one element of the Islamic Emirate of Afghanistan in Shah Wali Kot district. Between the 10th and 16th of September 2018 CJTF-OIR has conducted 64 strikes in Syria. CJTF-OIR‘s main focus in Syria at the moment is Deir al-Zour-Albu Kamal region where they did 64 strikes supporting SDF‘s operations against IS destroying an IS crew-served weapon, an IS heavy weapon, an IS technical vehicle, an IS engineering equipment, 19 IS supply routes, two IS command and control centers, nine IS fighting positions, an IS compound, an IS sentry location, two IS staging areas, an IS counter battery fire, two IS vehicles, two IS mortar tubes, two IS defensive fighting structures, an IS explosive hazard, an IS weapons cache, an IS heavy machine gun, an IS vehicle-borne IED facility, and an IS trench system.